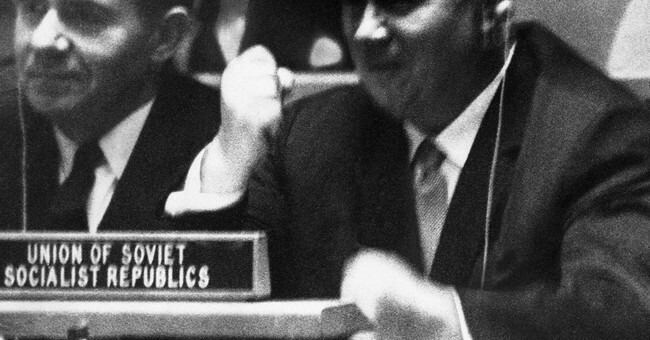 In a few weeks, we will come upon the anniversary of Soviet Premier Nikita Khrushchev’s infamous “We Will Bury You” speech. Given at the Polish Embassy in Moscow, the remarks were a declaration by the Soviet Union that history was on their side, that they would ultimately prevail because of their version of Marxist-leninism. It was Khrushchev’s version of the apocryphal communist quip that the east would sell the west the rope with which it would hang itself. Khrushchev was completely wrong in one sense, but perhaps not so far off in another. Obviously, the Soviet Union is long-dead, and the world is a better place for it. But this idea of our foreign rivals working to abuse the things that make the west great in order to achieve some kind of political and economic supremacy, and utilizing “useful fools” among us in order to achieve those ends, may have been chillingly prophetic. Nestled within the chaos of this month’s news: a muddied midterm election in which Democrats are trying to undo results by any means necessary; one TV news star having his White House press pass suspended and another having his family harassed by a mob outside their home; and an Attorney General unsurprisingly fired by a president grown weary of his management of the Department of Justice, was this important nugget: the Mueller Investigation of Russian Interference in the 2016 Presidential Election might be winding down! All of these things are inter-related. They might not, at first glance, seem to be, but they are. Despite the fact that the leftist thesis, that Vladimir Putin’s Russia tipped the scales on behalf of then-candidate Donald Trump, has not been proved, the reality is that Russia (and others) have long meddled in US politics and policy. They do this to make us weaker and them stronger. To foment chaos (Florida, anybody?) and put themselves at a competitive advantage. This is why, when America was gripped with anxiety as (possibly inoperable) bombs were being mailed to leftist activists and leaders, MSNBC’s Chuck Todd floated the idea that Russia might have been behind the plot. After all, nobody was physically harmed by the devices, and the investigation (coming just before the 2018 midterms) sowed more chaos and division. It isn’t just Russia. China has been incredibly active over the years. As Bill Gertz wrote in August in the Washington Free Beacon, China is an active participant in working to influence public policy—giving to public policy organizations, certainly, but also sending copious sums to university research organizations, academic institutions that we are supposed to trust as the highest-quality when it comes to substantive and impartial, dispassionate analyses of public policy. But since the formation of the Soviet Union, there has been Russian involvement in US politics and policy—like their involvement in the so-called “Peace Movement”, a movement that would have undercut the careful balance of power that kept the US and its allies free. But in this century, it’s US energy policy—especially our quest for petroleum independence, that piques extensive Russian interest. If the left had it’s way, the US would still be fighting to be free from foreign oil, saying it simply couldn’t be done (a conclusion that seems right out of a foreign government’s playbook). Had the these naysayers had their way, they would have been right, too. President Bill Clinton opposed opening ANWR, and our oil independence was delayed. Likewise, President Barack Obama worked diligently to curtail the drilling of oil and gas on public lands, and off America’s coasts. Given crisis after crisis in the Middle East (some exacerbated by Russian involvement), the US would have faced economy-crushing pressures on oil and gas prices, had smart Americans not started looking for petroleum on private lands. Between the exploration of the Bakken Shale oil and gas fields, and fracking, the US has been able to move further in the direction of oil independence, stabilizing global oil markets and insulating domestic prices from Middle Eastern instability as we have now become the largest global producer of crude oil! It’s no surprise that our foreign competitors don’t like this, and this raises the ghost of foreign interference in our political and policy processes—Russians supporting and involving themselves in American progressive organizations once again, in opposition to our domestic oil industry. The Natural Resources Defense Council has caught the eye of other members of Congress in this regard—the NRDC is vigorously opposed to fracking. In June of this year, a joint-letter by the Chairman of the Subcommittee on Oversight and Investigations, Rep. Bruce Westerman (R-AR), and the Chairman of the House Natural Resources Committee, Rep. Rob Bishop (R-UT), was sent to the NRDC asking for clarification of that organization’s relationship to China. The Sierra Club Foundation, the Tides Foundation, and the Sea Change Foundation are all opposed to fracking, and all are alleged to have possible ties to Russian money. Were these groups to succeed in hobbling America’s domestic oil production, they would be sacrificing the economic prosperity of our nation’s working families while putting money in the pockets of foreign governments. To be clear, these groups would be pushing for policies that undercut America’s economic interests regardless of what foreign governments might fund them. That’s what they do. This is what attracts our foreign adversaries to them, who are positively giddy that they have useful fools in America to help them bring about our nation’s economic demise. The rest of us have to be ever more cautious—lest Khrushchev's dire warning come to pass, six decades after he made it. Andrew Langer is President of the Institute for Liberty. He has a degree in International Relations/Soviet Studies from the College of William & Mary.